At the end of each year, our tradition is to highlight our Top 10 Top Picks Of The Year. While we highly endorse all of our top picks, these are products that have become part of our everyday life. We know there’s a preponderance of sweets here. You can guess that we have a sweet tooth; but also, that these items stood out as truly different in comparison to all the chicken and sausage products we tried. How can you get a great chocolate fix with no sugar? ChocZero is sweetened with a relatively new noncaloric sweetener, monk fruit, and it tastes like a premium-quality chocolate bar. ChocZero bars and syrups were created for people who follow a ketogenic “keto” diet; but anyone who wants to eliminate sugar can jump in. Pure pleasure: That’s what we think about the delectable yogurts and dessert pots from The Coconut Collaborative. The #1 brand of coconut milk-based yogurt brand in Europe, The Coconut Collaborate has come to the U.S., bringing their very impressive dairy-free products. Whether you’re vegan, lactose intolerant, want to eat more sustainably and/or eat more plant-based foods, The Coconut Collaborative yogurts must be tried. Don’t miss the dessert pots, pots de creme with a very high satisfaction factor. For picky palates, the moment of joy occurs when your first taste informs you that you have an outstanding bite of food. It’s when you know that it doesn’t get better than this. This was our reaction to Gooey On The Inside cookies (photo #1), a brand of handcrafted, baked-to-order cookies that was born when a career public servant decided to embark on her second career. Her “perfect” cookie recipe—crispy on the outside and gooey on the inside—is just great. These sweet chips that seem to be made from pieces of cannoli shells (photo #2) provide the cannoli experience without having to go out for cannoli, one of our favorite pastries. At home, we dip them into some sweetened ricotta cheese (we use Splenda), to enjoy “deconstructed” cannoli. Add some mini chocolate chips for fun. Lantana, a new brand of hummus made with white beans, black beans or yellow lentils instead of chickpeas, is shaking up the hummus category. Standing out in a sea of beige hummus, Lantana’s hummus is green (edamame), orange (carrots, chile peppers), purple (beets—photo #3), tan (black beans), yellow (yellow lentils) and other hues. The flavors deliver color to the plate and excitement to the palate. We’re hooked. The Bourbon & Barbecue is the best BBQ popcorn we’ve ever had. We have reviewed dozens of the world’s best chocolate brands. 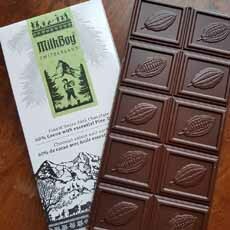 The first to turn our head in a while is MilkBoy Swiss Chocolate (photo #5). The company, based in Brooklyn, New York, produces its chocolate bars in Zurich, Switzerland. The milk, dark and white bars, plain or flavored, are equally splendid. Two must-tries: Alpine Milk Chocolate With Refreshing Lemon And Ginger and White Chocolate With Blue Potato Chips and Sea Salt. 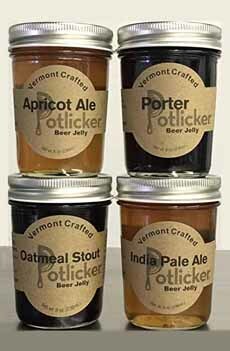 We’re enchanted by this line of artisan jellies from Potlicker Kitchen in Stowe, Vermont (photo #6). There’s real beer flavor in each spoonful, from Vermont craft breweries. What does beer jelly taste like? It tastes like the beer it’s made with, which is why you need to use great beers. The flavors and colors of Smashmallow (photo #7) are delectable, in Cinnamon Churro, Coconut Pineapple, Cookie Dough, Hot Cocoa, Mint Chocolate Chip, Root Beer Float and others. If your idea of marshmallows is “plain vanilla,” you’re missing out. There’s a lot of good olive oil around. Our kitchen has everything from good supermarket oil for sautes, and the top, pricey oils as “anointing oils,” to drizzle over foods as a garnish. A large producer with state-of-the-art technology, Zucchi produces oils that taste as good as some that are produced in small, artisan facilities. A 17.6-ounce bottle, less than $12, is worth your attention. We look forward to sharing more favorite discoveries with you in 2019. 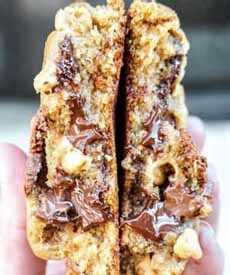 The chocolate chip cookie from Gooey On The Inside. No cannoli tubes to fill here! 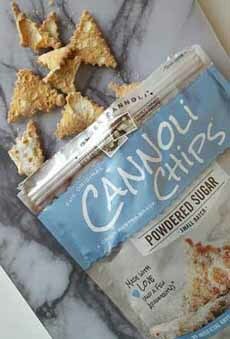 You can dip these chips into sweetened ricotta for the cannoli experience (photo courtesy The Original Cannoli Chips). 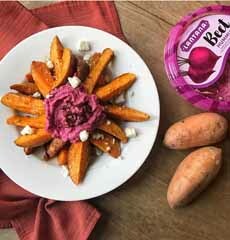 Flavors like Beet, Black Bean and Carrot make this line stand out (photo courtesy Lantana Foods). 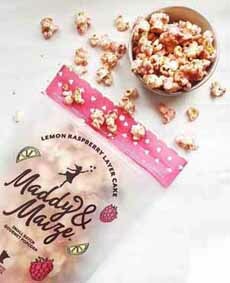 Raspberry Lemonade is one of a line of standout flavored popcorns (photo courtesy Maddy & Maize). MilkBoy is a new favorite, in dark, milk and white chocolate (photo courtesy MilkBoy). Small-batch beer jellies made with craft beers (photo courtesy Potlicker Kitchen). 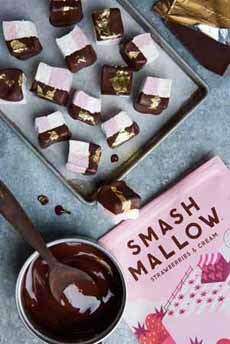 These flavored marshmallows are Wow! (photo courtesy Smashmallow).